And there the sale talk turned upside down. I have not bought the teleconverter yet, but I borrowed and tried it. 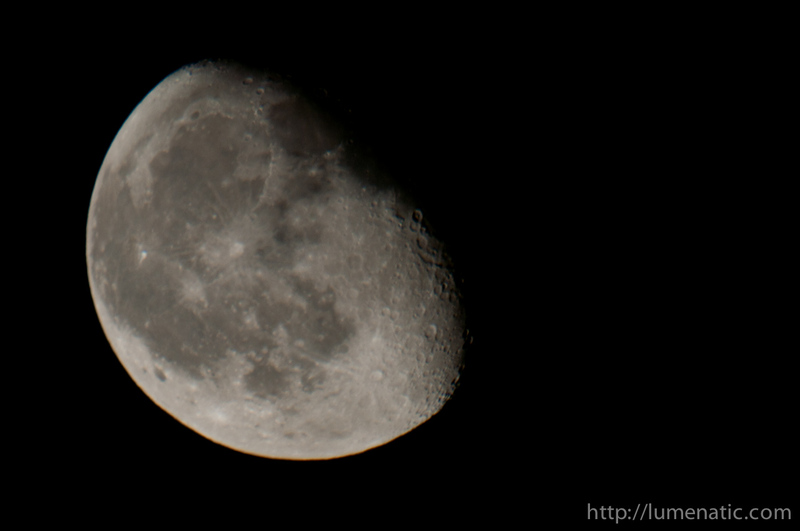 Some nights ago was a very juicy moon. I have that awesome Samyang 800 mm f8 mirror tele lens, and that I wanted to try with the teleconverter. 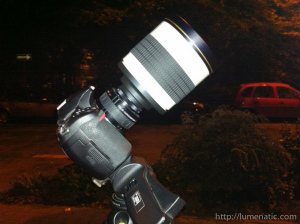 So the 800 mm Samyang transformed into a 1.600 mm tele monster. One thousand and six hundred millimeters. One point six meters of focal length *drool*. I could shoot the moon just in front of my home door. Here is the setup. I used a tripod (who would have thought that…), set ISO to 200, f8 (fixed with the Samyang lens), 1/60 shutter speed (manual mode) and, mucho importanto, exposure delay mode (more on that later). Result see top of the post. What I am drooling about most: The picture of the moon above is NOT A CROP ! That is the actual image I got out of the camera. The moon fills the viewfinder . Gnaaaaa. Ok, exposure delay mode. When you take a picture with a DSLR, the sequence is as follows: The mirror swings up, the shutter blades open, the sensor is exposed and the image taken, the shutter blades close, mirror swings back again. The mirror causes a slight amount of mechanical vibration as it halts in the top position. This vibration shakes the whole camera (only a little), but it is enough to blur the picture at such high focal lengths. The exposure delay mode is the pill against that. What it does is simply, well, delay the exposure. So the cycle is: Mirror swings up. PAUSE. Shutter blades open, sensor captures image, shutter blades close, mirror swings back. Actually the exposure delay mode was the crucial thing. 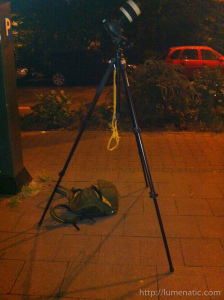 I also took sample pictures at ISO 2.000 and 1/400 sec to test if a shorter exposure time would produce a sharper image. Failed. Bottom line: Teleconverter much fun, to be tested at daylight with an autofocus lens again someday.